Governor Andrew M. Cuomo recently announced a new environmental education center will be part of the next phase of a $16.9 million transformation of Central New York’s most-visited State Park. This fall, New York State Parks will convert a deteriorated 1940s boat house on Green Lake into an environmental education center and related improvements. The historic boathouse will be moved back from the water’s edge, where it is exposed to flooding, and renovated. 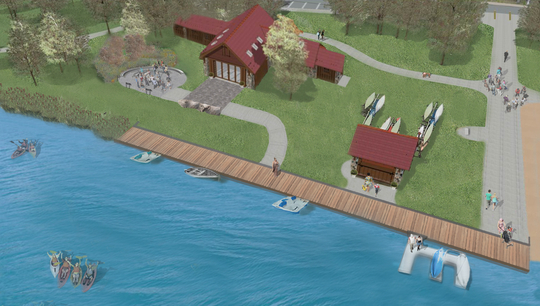 The new center will include new indoor classroom/multipurpose space, kitchenette and restrooms as well as an outdoor classroom, lakefront boardwalk and canoe/kayak landing, new boat rental booth and storage racks, and a fishing pier. In conjunction with the education center, State Parks will undertake work to improve the park ecosystem, including restoring the lake edge, redirecting storm water away from the lake; upgrading electric systems; and rehabilitating the deteriorated parking areas with green elements. Several other major improvements to Green Lakes State Park have been completed in time for the summer season, including renovation of the golf course clubhouse, Pine Woods Campground, and park entrance. Read more. 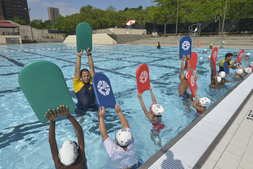 New York State Parks’ annual free Learn-to-Swim program is helping approximately 3,000 children be safe and have fun in the water this summer. Now in its fifth year, the Learn-to-Swim program is offered through a partnership among State Parks, the Department of Health; the American Red Cross; the National Swimming Pool Foundation and the Master Pools Guild; and the Northeast Spa and Pool Association Foundation. Hundreds of individual classes are being taught for all ages and levels – varying from swim lessons to water safety presentations at 27 locations across the state. These will build on the instruction already offered at state park facilities as part of programs arranged by summer camps, municipalities and other partner organizations. The Learn-to-Swim program expands the state's commitment to serving more youth at State Parks. Read more. 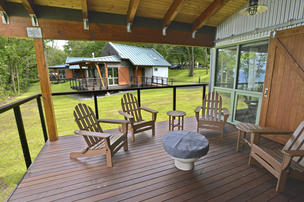 Beautifully appointed new waterfront cottages were unveiled on the shores of Seneca Lake at Sampson State Park. The $2.9 million project created 10 contemporary one- and two-bedroom cottages with a kitchenette, bathroom, covered outdoor deck, and comfortable furnishings and lighting. The cottages rest on a slope overlooking Seneca Lake, near the Seneca Lake Wine Trail. State Parks will host an open house August 1 from 3:30 – 6:30 p.m. for the community. The Cottages at Sampson will be available for rent beginning at 9 a.m., Wednesday August 2. Weeklong reservations are required through Labor Day and will be taken at the Sampson Park Office or can be made by calling 315-585-6392. Cottages will be available from May - October each year. 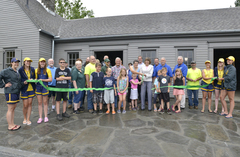 State Parks Commissioner Rose Harvey visited Fillmore Glen State Park in Cayuga County to celebrate the renewal of the park’s historic 1930 main pavilion. The pavilion anchors the park’s swimming area, gorge trail, picnic ground and replica President Millard Fillmore boyhood cabin. 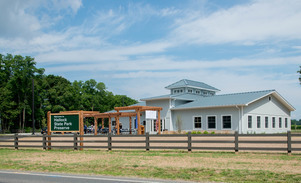 As the site of countess summer camps, wedding receptions, family reunions and other gatherings, the pavilion is an important community center for the village of Moravia. Exterior improvements to the pavilion included replacing the roof, repairing windows, upgrading its siding while the interior restrooms, multipurpose room and lifeguard station were totally renovated. Read more. How long have you been with the agency? 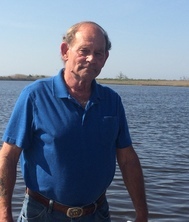 I have 20 years of service with the State. What does someone in your position do? I work out of the SPIF Office (State Parks Infrastructure Fund) and I oversee over 60 employees. Our crews are split up on each job by trade: Carpenters, Electricians, Plumbers, Masons, Painters, Laborers and Heavy Equipment Crew. I also run a tree crew for the Long Island Region. I work closely with the Engineering Department on Long Island and the Albany Office collaborating and planning for all upcoming projects. What’s the coolest thing on the job you’ve ever seen or done? After Hurricane Irene and Super Storm Sandy devastated our shoreline communities, SPIF, along with outside contractors, we were able to reconstruct and rebuild the areas and parks to get them up and running quickly for the public to enjoy. Is there a destination in the park/region you’d recommend to someone? Long Island has some of the most pristine, sandy beaches along the south shore; Heckscher, Robert Moses, Jones Beach, along with fantastic fishing, great campsites, and clear biking and walking trails. Bethpage State Park has one of the best and now iconic golf courses on Long Island. What inspired you to work in the parks system? I was self-employed for over 20 years. I then decided I needed benefits and a retirement plan. After joining the Park family, I realized there were more benefits than I ever expected. My coworkers and all the State workers I have had the pleasure of working with are some of the best people I know. Volunteers complete hundreds of projects at our parks to help keep them beautiful and ensure a good experience for all visitors. Many of the projects provide exciting new amenities. A unique partnership with the community at Max V. Shaul State Park resulted in the installation of Little Free Library in the park. The book exchange box houses a small library of books that can be borrowed and shared free-of-charge among park patrons and campers. A ribbon-cutting for the little library was held at the park on I Love My Park Day. The library was built and installed by the West Fulton Arts Council, part of an initiative in the Town of Fulton where local artist Neil Driscoll introduced three Little Free libraries thanks to a generous Community Arts Grant awarded by Greene County Council on the Arts. Inspired by the national movement of Little Free Library—a nonprofit organization that promotes love of reading, builds community, and sparks creativity by fostering neighborhood book exchanges—each library will stock a range of books from children's classics to adult fiction and bear the same simple message: "Take a book. Leave a book." Do you have an innovative idea to improve your favorite state park or historic site? Learn more about I Love My Park Day, Friends Group activities and other volunteer opportunities at parks.ny.gov.